Add a Tex-Mex flavor kick to this smart black bean corn salad with light ranch plus hot pepper sauce. 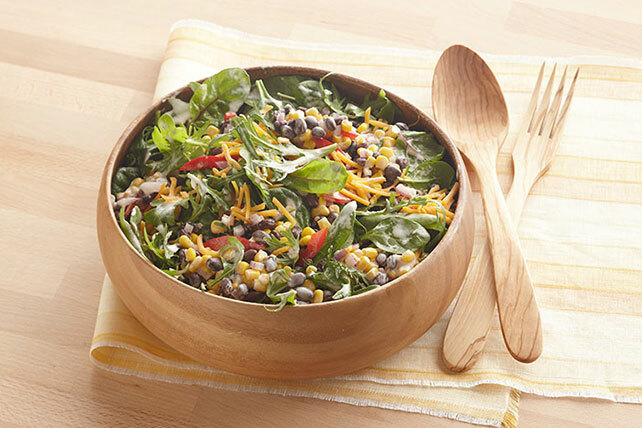 Spicy Southwest Black Bean Corn Salad tastes great with cheddar sprinkled on top. Mix dressing and hot pepper sauce. Toss salad greens with beans and vegetables in large bowl. Add dressing mixture; toss to coat. Top with cheese. Refrigerate any leftovers and use to make wrap sandwiches. Just spoon leftover salad onto flour tortillas, then roll up and enjoy. Prepare as directed, omitting the cheese, using KRAFT Fat Free Thousand Island Dressing, increasing the onions to 1/2 cup, and substituting 1/4 tsp. ground red pepper for the hot pepper sauce.